On arrival at Delhi Railway Station / Airport from there you will meet and assist by our representative and drive to hotel. On arrival check into hotel. Rest of the day is leisure for you. Dinner & overnight stay at hotel. After breakfast check out from hotel and drive to Bharatpur (251 km / 6 hrs). On the way you will visit the Taj Mahal at Agra. On arrival at Bharatpur check in to hotel. Bharatpur is known for its migratory bird Siberian cranes that throng the sanctuary in winters every year in search of food and warm weather. Rest of the day is leisure for you. Dinner & Overnight stay at Bharatpur. After breakfast (early morning) from hotel the day is kept for the rickshaw ride in Bharatpur bird sanctuary where you can spot as many as 375 species of birds. We suggest you to do a morning and an evening safari. Evening came back to hotel. Dinner & overnight stay at hotel. After breakfast check out from hotel and drive to Ranthambore (300 km / 6 hrs). On arrival check in to hotel after taking same rest or freshen up than proceed for an evening safari in the wildlife Sanctuary. There you may get to see tiger, leopard, jackal, hyena, sloth bear, python, crocodile, cobra, Indian roller bird, Bonelli's eagle, Crested hawk eagle, Great Partridge, king vulture, Golden-woodpecker. Evening came back to hotel. Dinner & overnight stay at hotel. After breakfast from hotel you will do a morning and an evening safari. 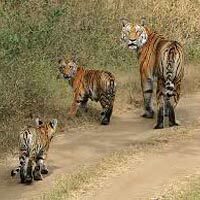 Drive to see the Indian national animal (tiger) in its natural surroundings. Evening came back to hotel. Dinner & overnight stay at hotel. After breakfast you can either do a morning safari in Ranthambore and then drive to Jaipur (176 km / 4 hrs) or after breakfast drive to Jaipur. On arrival check in to hotel after taking some rest or freshen up than proceed to visit the city that will include Amber Fort, Hawa Mahal, City Palace and Jantar Mantar observatory at the Amber Fort. We keep our evening engaged with stunning view of the Pink City from the hills of Nahargarh Fort and a breathtaking sunset. Dinner & Overnight stay at Jaipur hotel. After breakfast check out from hotel and drive to Sariska wildlife sanctuary (120 km/ 2.5 hrs). On arrival check in to hotel after taking some rest or freshen up proceed to visit sariska Tiger Reserve Sanctuary for another round of encounter with the wildlife. Evening came back to hotel. Dinner & overnight stay at hotel. 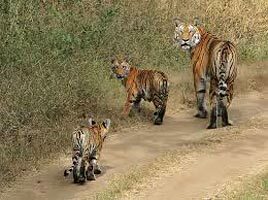 After breakfast check out from hotel and drive to nearest Airport / Railway Station to catch your Train / Flight & return to home with sweet memories of Wildlife Rajasthan.